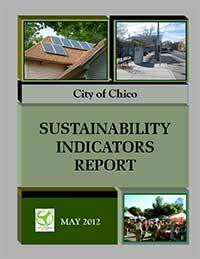 On April 12, 2011, Chico's City Council adopted an innovative and comprehensive General Plan. The new General Plan reflects the community's commitment to building a sustainable future. Sustainability entails aligning the built environment and socioeconomic activities with nature's constraints and opportunities. Central to this concept is meeting both present and future needs through a balance of three considerations: maintenance of a healthy and equitable society, protection of the environment, and ongoing prosperity of the local economy. These components are interdependent and equally important. The General Plan calls for the development of indicators to gauge progress in advancing its sustainability-related policies and goals. An indicator serves as a proxy, or representation, to gauge the status of a larger issue. The indicators included in this report have been selected because they are understandable, quantifiable, and valuable for generating community dialogue. A starting place, or base year, has been established for each indicator to reflect the state of the indicator at a particular point in time. A base year is a point of reference to demonstrate movement toward or away from a goal over time. The report is divided into elements addressing three subjects: Natural Systems and Agriculture, Built Environment, and Socioeconomics. Each element is further refined into sections. 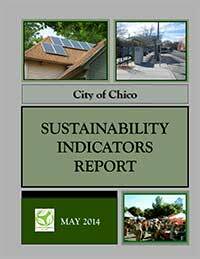 You can view the most recent Sustainability Indicator Report here. The report is reviewed annually in conjunction with the Chico 2030 General Plan Annual Report, which considers and measures additional topics that are closely linked with community sustainability.